The Bloody Rock trail – a primary entry point for the Snow Mountain – Middle Eel Wilderness Area. FOER staff and Board spent a weekend in the Upper Eel river watershed in late November. 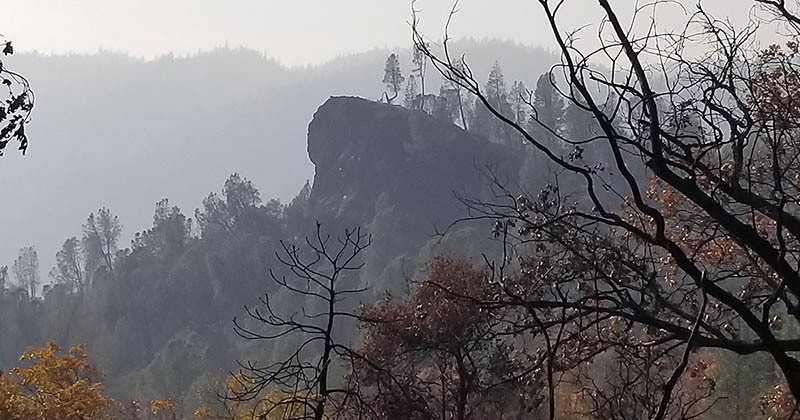 Amidst the lingering smoke of the tragic Camp Fire that destroyed the town of Paradise, we took stock of the impacts of the Mendocino Complex Fire, the largest in California’s history, that burned through the upper Eel only a few months ago. Despite the destruction elsewhere, there’s a lot of evidence of resilience. We mostly saw a healthy mosaic fire pattern – high intensity in chaparral, with legacy trees still green. Even through the smoky haze, Bloody Rock is a prominent sentinel of the watershed. Bloody Rock, where dozens of Yuki people died in one of many massacres, is a reminder that we are not the first here to face terrifying changes in the world around us. The path to restoring balance to the Eel River starts with honoring both what we’ve lost and that which perseveres. Giant boulders and cold deep pools make the Bloody Rock Roughs a fish refuge even in the driest years. Bloody Rocks Roughs on the upper mainstem Eel River, miles above the Lake Pillsbury reservoir, might be a barrier to steelhead passage. 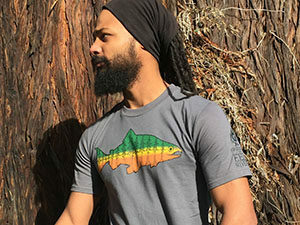 The presence of native rainbow trout (which are simply steelhead that don’t migrate to the Pacific) strongly suggests the bigger fish could get past the barrier just fine in most years — if they weren’t blocked out of the watershed by Scott Dam. 130’ tall Scott Dam completely blocks fish passage to the upper Eel and is dangerously ‘anchored’ to an active landslide on its southern end. 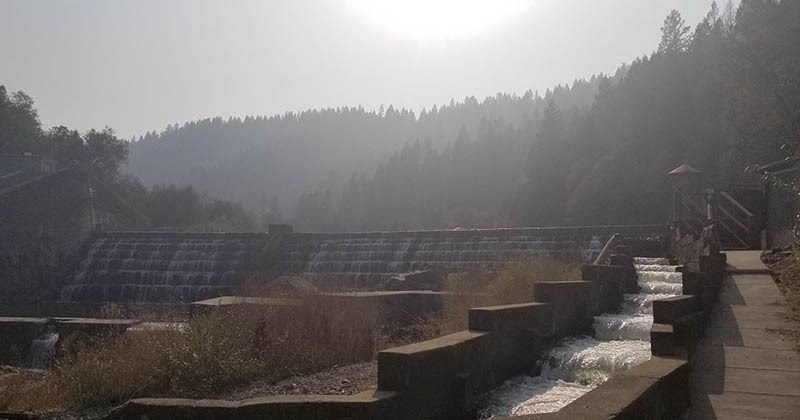 Scott Dam was built in 1920, long before the federal government began requiring hydroelectric projects to provide fish passage wherever feasible. That requirement does apply, however, to the relicensing process Scott Dam is now undergoing before FERC, the Federal Energy Regulatory Commission. 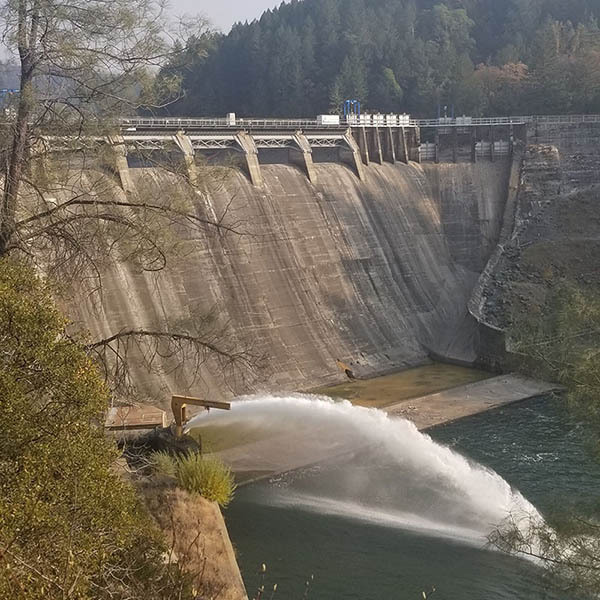 The estimated $50-100 million cost of providing fish passage appears to be one big reason dam owner PG&E is now trying to sell off the Eel River dams right in the middle of the relicensing process. Downriver, the Cape Horn Dam and Van Arsdale Reservoir complete the diversion infrastructure for the Potter Valley Project. In theory, the water released from the upper basin dams supports salmon spawning in the Eel River. In wetter years, Thanksgiving is generally the time when we’d see Chinook salmon surging up the fish ladder at Cape Horn, the lower of the two dams. But not this year. There has been almost no rain again this fall. Eel River salmon can’t begin their trip up the river until there’s enough water in the lower river to swim in. Needle valve releases draw down the reservoir in preparation for the rainy season and to provide flows for fish. Unfortunately, more than half of that water is currently being diverted to the Russian River. You’d think, in such circumstances, that we’d be releasing water from the dams to help Eel River salmon get up the river. You’d be wrong. Two-thirds of the water coming out of Scott Dam right now is being diverted to Potter Valley and the Russian River. Of the 120 cfs released from Scott Dam, 81 cfs are going to Potter Valley. Only 39 cfs are going to the Eel. This is why we keep fighting to restore the Eel. For twenty four years now, Friends of the Eel River have been working towards a free-flowing Eel River and fisheries recovery. With the relicensing and possible auction of the dams underway, we have an opportunity to remove the biggest hurdle to their recovery in the coming years. Please give generously to help achieve our vision of a thriving Eel River watershed.